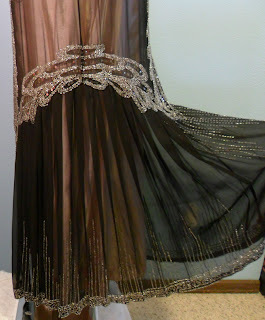 ONE OF THE MOST BEAUTIFUL FLAPPER DRESSES I HAVE SEEN AND IN REMARKABLE CONDITION FOR BEING 90 YEARS OLD!!!!!! BEAUTIFUL BLACK SILK CHIFFON WITH THE TRADITIONAL 20'S DROP WAIST, DECORATED WITH SILVER SEQUINS, CLEAR SEED BEADS AND CLEAR SILVERED BUGLE BEADS THAT REALLY MAKE IT SPARKLE!!! 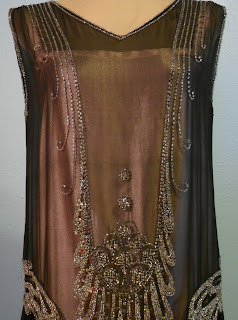 THE CHIFFON IS IN WONDERFUL CONDITION, STRONG ENOUGH TO WEAR WITH NO HOLES TO NOTE!!! THE INCREDIBLE BEAD WORK IS THE SAME ON THE BACK AS THE FRONT WITH A BEAUTIFUL DESIGN AT THE HIPS THAT FLOWS DOWN IN A CURVE ACROSS THE FRONT WHERE IT MEETS THE GORGEOUS DESIGN ON THE MIDDLE FRONT AND BACK. THE BOTTOM CARRIES A BEAUTIFUL ABSTRACT DESIGN ALL AROUND THE HEM WITH A DESIGN IN THE MIDDLE FRONT AND BACK THAT ECHOS THE TOP. THE SIDES OF THE SKIRT ARE PLEATED AND HAVE PEAKS AND VALLEYS OF BEADING THAT SHIFT AND SPARKLE WITH EACH STEP. THERE ARE JUST A FEW BEADS MISSING UNDER THE ARM ON THE RIGHT SIDE (PICTURE #7) AND I SEE WHERE ONE HAS BEE LEFT OUT WHEN IT WAS MADE ON A LINE GOING DOWN THE FRONT OF THE SKIRT - THIS IS CLOSE TO THE SIDE AND IS SOMEWHAT HIDDEN IN THE PLEATS. I NOTICED A FEW OTHER SPOTS WHERE THE THREAD IS COMING LOOSE SO I AM ADDING PLENTY OF EXTRA SEED AND BUGLE BEADS FROM THE SAME PERIOD IN CASE OF LOSS. THERE ARE ABOUT 6 SEQUINS MISSING ON THE BOTTOM IN FRONT ON THE 3RD LOOP FROM THE MIDDLE LOOP (SHOWN IN PICTURE #3) AND SEVERAL SEQUINS MISSING ON THE BOTTOM IN BACK ON THE LAST 5 LOOPS TO THE LEFT OF THE CENTER LOOP (PICTURE #12). IT SEEMS THAT THE SEQUINS ARE NOT AS HEAVY ON THE RIGHT HIP AS THEY ARE ON THE LEFT BUT THE THREADS ARE NOT LOOSE SO I WONDER IF THIS IS HOW THEY WERE APPLIED???? 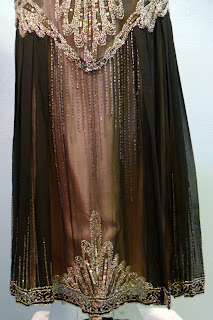 I CAN SEE SEVERAL PLACES WHERE THE BEADS HAVE BEEN REPLACED (THESE TOO ARE PERIOD BEADS) BY THE OWNER ALL THOSE YEARS AGO - I THINK THIS MUST HAVE BEEN A VERY TREASURED DRESS TO SOMEONE!!! THE PINK UNDERSLIP IS SILK AND EVER SO SOFT, IT IS ALSO STRUCTURALLY SOUND!!! IT DOES HAVE A LOT OF PILLING AND A FEW SNAGS ESPECIALLY ALONG THE SIDE SEAMS AND BOTTOM WHERE THE BEADING RUBS IT, ALSO EACH STRAP NEEDS TO BE SEWN BACK/CLOSED (THIS CAN BE SEEN IN PICTURES 10 &11). IF YOU WOULD PREFER NOT TO HAVE THE SLIP ON IT CAN EASILY BE REMOVED AS IT IS ATTACHED BY JUST A SHORT SEAM AT THE TOP OF THE SHOULDER. SHIPPING COSTS INCLUDE INSURANCE AND TRACKING ON THIS ITEM. THE MEASUREMENTS SHOWN HERE ARE FROM THE PINK UNDERSLIP FIRST AND THE SECOND NUMBER IS THE DRESS ITSELF UNLESS OTHERWISE NOTED. MEASUREMENTS IN INCHES TAKEN LYING FLAT AND DOUBLED WHERE APPROPRIATE. ARM OPENING - 16 AROUND. PLEASE TAKE A LOOK AT THE OTHER ITEMS I HAVE LISTED - I'M ALWAYS HAPPY TO COMBINE SHIPPING - PLEASE REMEMBER TO WAIT FOR AN ADJUSTED INVOICE THAT REFLECTS COMBINING. PAYMENT MUST BE MADE WITHIN 3 DAYS OF AUCTIONS END UNLESS PREVIOUS ARRANGEMENTS HAVE BEEN MADE OR ITEM WILL BE RELISTED AND A NON PAYING BIDDER CLAIM WILL BE FILED. ALMOST ALL OF THE ITEMS I SELL ARE ANTIQUE OR VINTAGE SO PLEASE TAKE INTO CONSIDERATION THESE ITEMS HAVE HAD A PAST LIFE ( IF ONLY THEY COULD TALK!) AND WILL NEVER BE IN "NEW" CONDITION AGAIN. I DO MY BEST TO DESCRIBE ALL FLAWS AND FAULTS BUT I AM ONLY HUMAN AND THOUGH I HAVE NOT YET MADE A MISTAKE IN MY DESCRIPTION I'M SURE THE DAY WILL COME WHEN I DO - IF YOU ARE THE ONE THIS HAPPENS TO PLEASE LET ME KNOW IMMEDIATLY AND I WILL GLADLY MAKE AMENDS!!!! I DO VALUE MY 100% FEED BACK RATING!!! I RECOMMEND ALL CLOTHING AND TEXTILES BE PROFESSIONALY CLEANED BEFORE USE AS I DO NOT KNOW WHAT THEY WERE EXPOSED TO IN THIER FORMER LIFE.